Have you ever tried to make a cup of tea in an American hotel room? The off-brand tea bags are usually there in a little basket with the coffee and the chemical creamer. The only appliance provided to heat the water is a much-used coffee maker. The tea you attempt to brew tastes like a horrible concoction of a cross between tea and coffee. Yuck-o! I no longer waste my time brewing in-room tea when traveling unless I take my own hot water pot (and I have been known to do just that.) I have stayed in hotels in 2 countries where guest rooms are equipped with tea brewing equipment. The first was Japan. I was very impressed they provided the equipment, but I'm not a major fan of green tea. 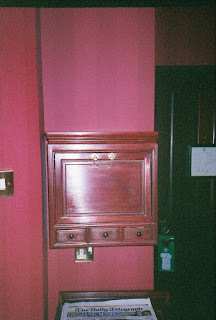 I took the photo above of a nifty little cupboard in my London hotel room. It is equipped with an electric tea kettle, teacups and PG Tips Tea. Now that makes for a good strong British cuppa first thing in the morning! 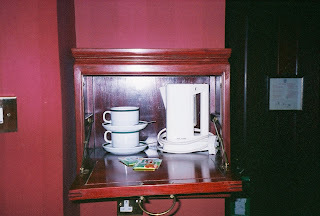 On motel tea, even if they have decent tea and a kettle, the plastic milk ruins the flavour. *LOL* Well Sarah, that is where I am different from the typical Brit -- I don't drink milk in my tea. Looks like a great trip! 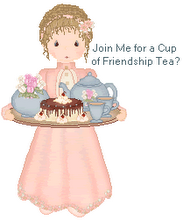 I especially LOVE the teapot with the red British double deckers!